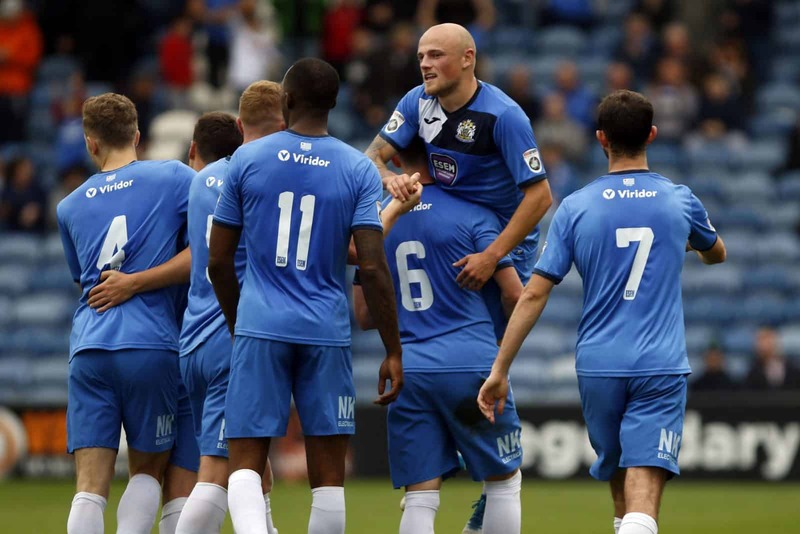 The Hatters registered a comfortable home victory over bottom-placed club North Ferriby that broke their duck against the ‘Villagers’, as well as continuing an unbeaten record at Edgeley Park that now stretches back over ten months in all competitions. 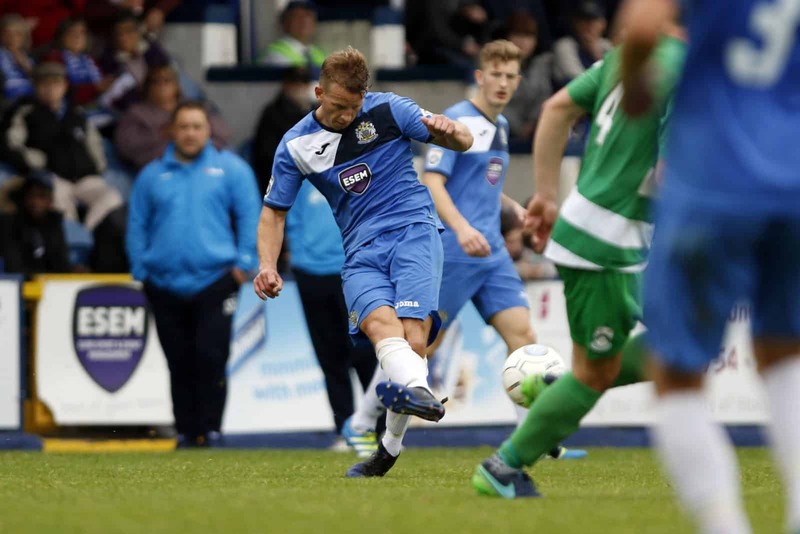 County’s first-ever three-point haul at Ferriby’s expense came courtesy of two goals in each half, and either side of a sole successful strike by the visitors shortly after the interval. The Hatters took to the field in an identical 3-4-1-2 formation to that which had served them well against Curzon Ashton in the FA Cup a week previously – but showing one change in personnel, with Gary Stopforth replacing Matty Warburton, who had not trained since suffering a dead leg in the course of that Cup-tie. 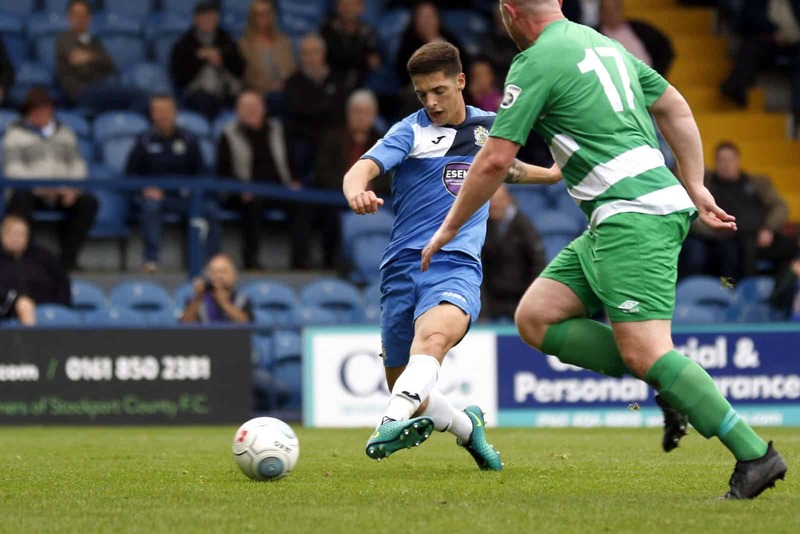 County forced the early pace by earning four corners in the opening stages – with the third of those won following a well-struck shot from Bohan Dixon that visiting goalkeeper Ross Durrant tipped around the left upright. Durrant proceeded to block Jason Oswell and smother a low shot from outside the box by Adam Thomas, before his opposite number, Ben Hinchliffe, kept out Curtis Bateson at point-blank range and parried behind a shot from Ferriby’s new signing from Rotherham United, Kuda Muskwe. With the contest just past the half-hour mark, County went ahead. Acting captain Stephen O’Halloran took a short throw on the left to Sam Walker, who drilled the ball across for Oswell (after earning the original throw) to bundle in for his tenth goal of the campaign. Hinchliffe was called into action twice more in quick succession, as he parried one shot, and caught another, unleashed on each occasion by Bateson. 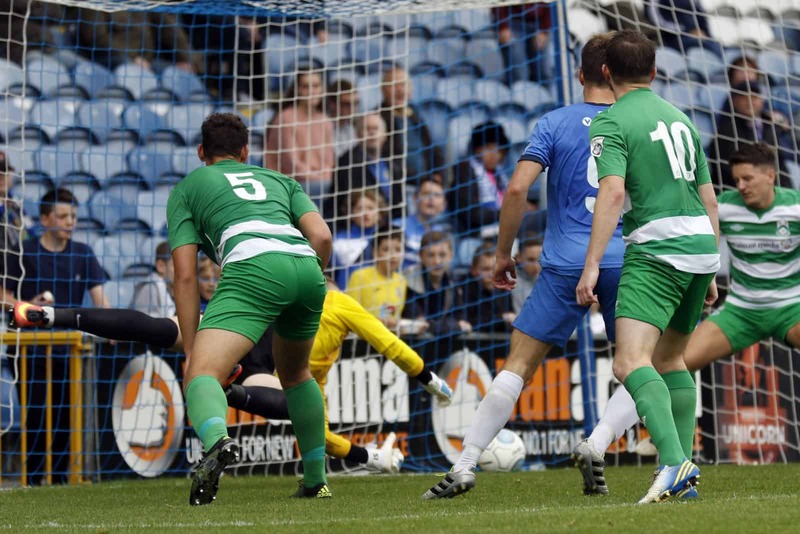 But within nine minutes of opening their account, the Hatters were to double the lead. 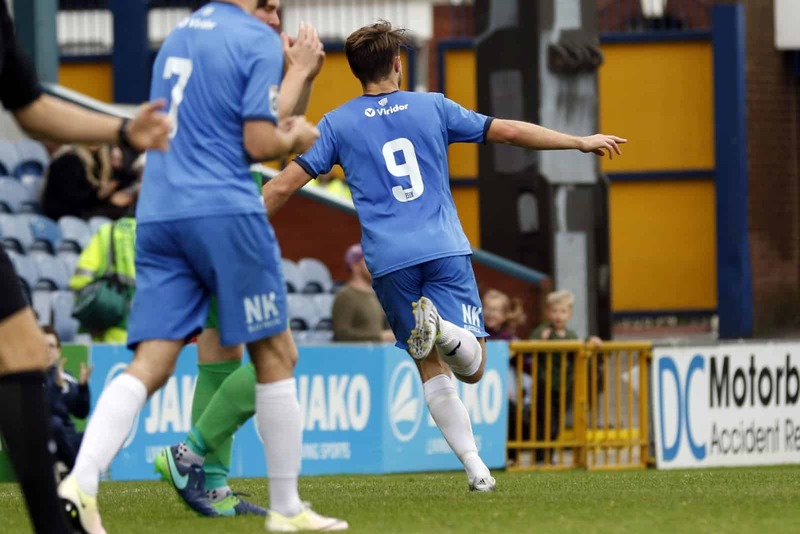 Following the award to County of a free-kick, 25 yards out, Durrant parried out the delivery by Thomas – only for Scott Duxbury to send the ball over from the left for Sam Minihan, by the far post, to head home. HALF-TIME: County 2 (Oswell, 30; Minhan, 39), North Ferriby 0. The second half began with a double-substitution by the Villagers, and within two minutes they had halved the arrears. Chris Smalley was dispossessed, before Ferriby broke forward and Darnelle Bailey-King rifled past Hinchliffe from the edge of County’s box. Ferriby’s hope was short-lived, however, as the Hatters proceeded to restore their two-goal advantage in the very next minute. Duxbury, as a prelude to his second assist of the afternoon, carried the ball the length of the visitors’ half, before crossing from the left for Oswell to turn in. And eight minutes later, Duxbury crowned a fine individual performance with a goal of his own, when he beat Durrant to a high ball in the Ferriby box, headed past the visiting ‘keeper and slotted into an empty net. The Hatters made three attacking substitutions with a view to keeping proceedings lively, and Warburton, as one of the replacements, was twice denied by Durrant after cutting in and shooting from opposite flanks. 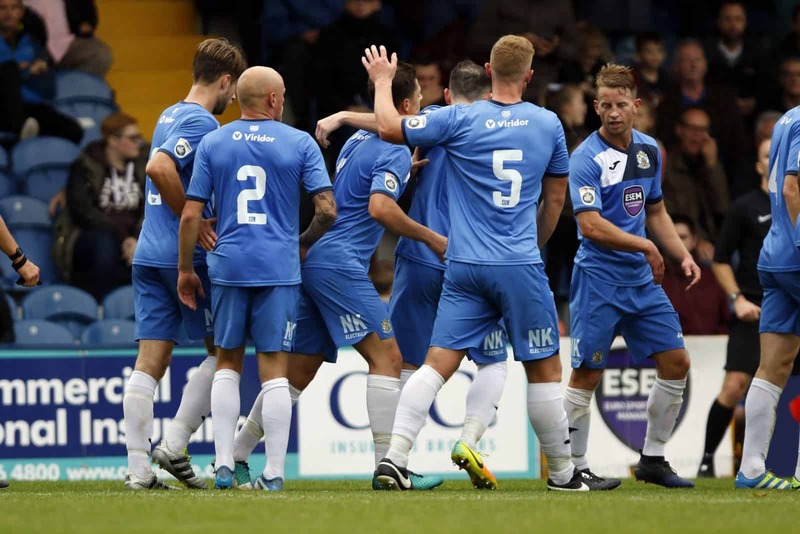 In the event, there were to be no further additions to the scoreline – and County had to play the final five minutes with ten men, after Minihan limped off with a recurrence of his previous groin injury. But the win – fully justifying the decision to field a lucky thirteen mascots beforehand! 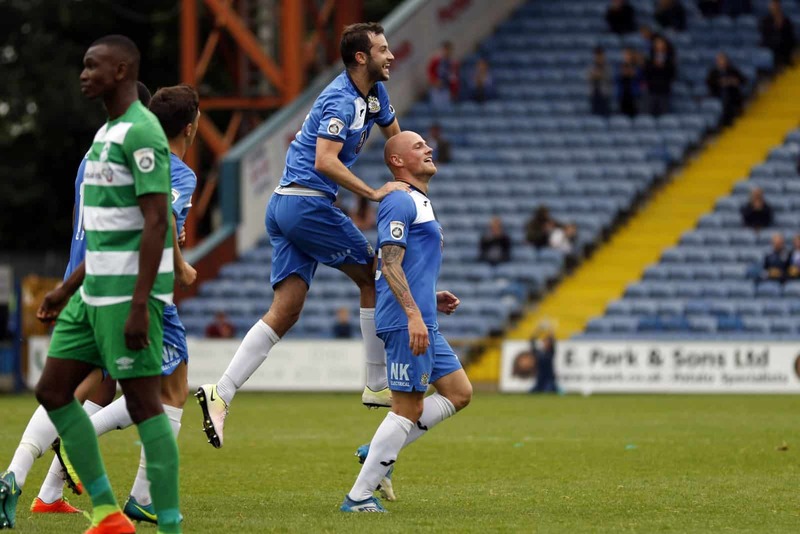 – lifts the Hatters four places into tenth, and just a point away from the play-off positions. FULL-TIME: County 4 (Oswell, 30 and 48; Minihan, 39; Duxbury, 56), North Ferriby 1 (Bailey-King, 47). Team: Hinchliffe, Minihan, Duxbury, Cowan, Smalley, O’Halloran (Capt. ), Thomas (McKenna, 78), S Walker, Oswell, Stopforth (Ball, 61), Dixon (Warburton, 61). Man of the Match: Duxbury.